Changes in dental plaque following hospitalisation in a critical care unit: an observational study. Sachdev M, Ready D, Brealey D, Ryu J, Bercades G, Nagle J, Borja-Boluda S, Agudo E, Petrie A, Suvan J, Donos N, Singer M, Needleman I. Critical Care 2013 Sep 4;17(5):R189. The impact of hospitalization on dental plaque accumulation: an observational study. Needleman I, Hyun-Ryu J, Brealey D, Sachdev M, Moskal-Fitzpatrick D, Bercades G, Nagle J, Lewis K, Agudo E, Petrie A, Suvan J, Donos N, Singer M.
J Clin Periodontol. 2012 Nov;39(11):1011-6. The impact of hospitalization on oral health: a systematic review. Terezakis E, Needleman I, Kumar N, Moles D, Agudo E.
J Clin Periodontol. 2011 Jul;38(7):628-36. The prevalence of oral and systemic pathologies in the European University of Madrid. Elisa qualified in her home city, Madrid, in 2005. 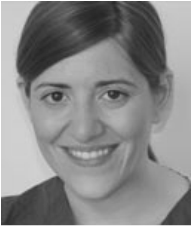 She then took further diplomas in occlusion and oral rehabilitation (New York University) in 2007 and a Diploma in Endodontics (University of Valencia) in 2008. In 2008 she enrolled in the three years full-time MClinDent in Periodontology at the Eastman Dental Institute, which she completed with Distinction in 2011. She was awarded a certificate in Periodontics from the European Federation of Periodontology in the same year. Currently, Eli combines periodontal private practice in Brighton with a Consultant position at the University College of London Hospital (Eastman Dental Hospital). She runs her NHS clinic and is also responsible for the patient waiting list and patient allocation to the periodontology postgraduates students at the Eastman Dental Hospital. Eli has been involved with teaching and training with the International Team of Implantology in the London Education Weeks and has presented clinical cases internationally.